Because the last US built Rambler rolled off the assembly line in Kenosha, WI on June 30, 1969 they are largely forgotten by the non automotive obsessed public at large. There was however a time when you could go to a dealer that dealt exclusively in the odd cars and we recently came across a picture to prove it. 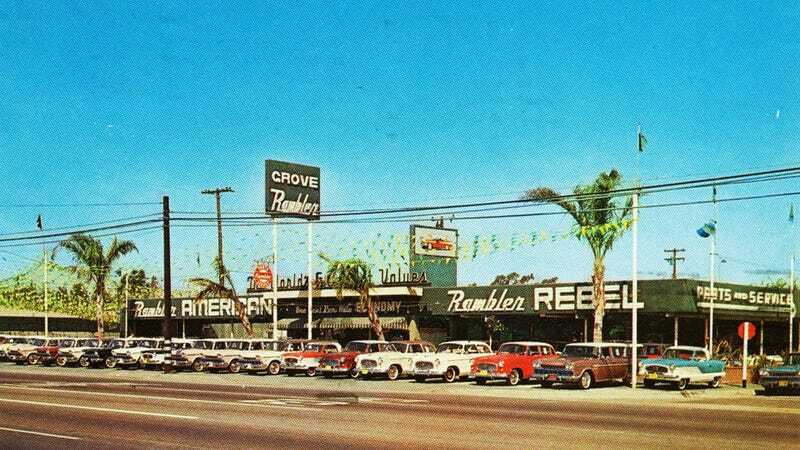 Grove Rambler Sales, formerly located at 12222 Garden Grove Boulevard in Garden Grove, California had nothing but Ramblers for sale on their lot (besides a lone Metropolitan) when this photo was taken. We aren't sure exactly the date this picture was taken but judging from the selection of cars it was sometime between 1958 and 1960. It seems likely the last time that such a large collection of Rambler Americans and Rambler Ambassadors were together in one place was also somewhere right in this time period. These days there is a strip mall where Grove Rambler Sales once sat and we can only guess where the selection of Ramblers and the Nash pictured here ended up. Luckily we still have vintage photographs like this one to remind the world there was a time you could find a dealership devoted exclusively to the quirky cars from Kenosha.